The situation in Syria is getting more precarious, and it is difficult to imagine what life and work must be like for NGOs and others in this war zone. Bashar al-Assad’s regime is clearly teetering, so it is trying riskier maneuvers. A Syrian military foray into the Golan Heights brought retaliation from Israel and skirmishes on the border with Turkey have led that country to request Patriot missiles. But the worst news is the widespread reports that the Syrian military has loaded precursor chemicals for sarin, a deadly nerve gas, into bombs, presumably to potentially be used against opponents of Assad’s regime. The challenges are immense for NGOs functioning amidst active warfare perpetrated by a regime that seems prepared to hold onto power regardless of the human costs. On Wednesday, for example, the Syrian Observatory for Human Rights reported that 123 people were killed in the ongoing violence. 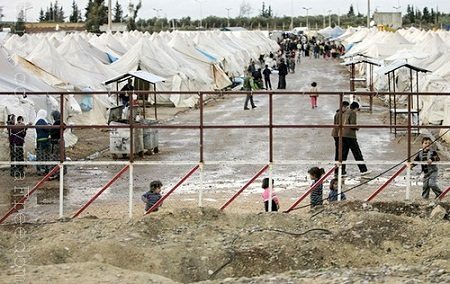 Last month, the Union of Syrian Medical Relief Organizations charged that 95 percent of aid that had been sent to the Syrian Arab Red Crescent had been taken by the Syrian government and was not reaching people in need of humanitarian assistance. Nonetheless, the Syria Crisis Appeal effort of the British Red Cross is still funneling aid into Syria through Red Crescent by sea and through convoys from Dubai. But just this week, the United Nations announced that it is suspending all of its aid activities in Syria due to the declining security situation. According to a Reuters report, the withdrawing agencies include the U.N.’s World Food Programme, the U.N. Children’s Fund (UNICEF), and the U.N. program on aid for refugees. Eight U.N. staff members have already been killed in the Syrian violence. In terms of dollars, U.S. humanitarian aid in response to the Syrian warfare is less than what neighboring Turkey is providing, though some of it is becoming more visible in the refugee camps that are popping up. Last week, USAID’s Rajiv Shah visited the Killis refugee camp housing 13,000 Syrians just over the Turkish border. One of the programs there is a $3.9 million effort through the USAID-funded Food for Peace office providing each family in the camp with an electronic Visa card they can use to buy food. But even the refugee camps in Turkey and Jordan might be in danger if the Syrian air force takes an order from Assad to use chemical weapons on the camps that the government imagines harbor Syrian rebels.